Well, it looks like another Japanese pro-tuner is giving a hand to spruce up the Grand Livina. We’ve already seen what IMPUL can do; here is AUTECH giving the popular MPV a go. For the front, the Grand Livina’s front grille is polished in chrome. The MPV gets a new bumper design, which is gets some chrome garnishing. A set of 15 inch six-spoke AUTECH wheel replaces the standard set of wheels. These AUTECH wheels are diamond-cut with each spoke featuring a gunmetal-textured finish. An AUTECH emblem is stuck to the tailgate as a signature of their handiwork. Inside, you have a choice brown or black leather seats and door trim. 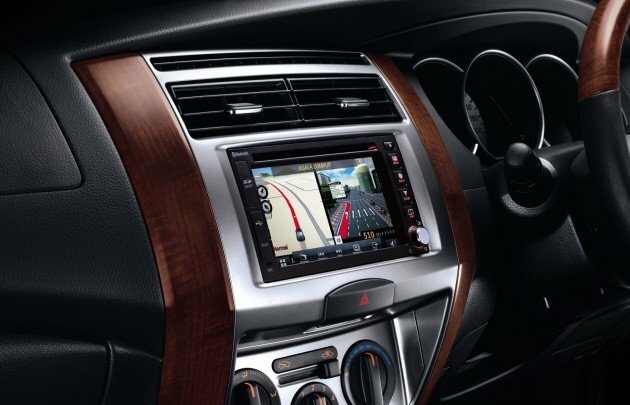 The seven-seater is also outfitted with a six-inch touchscreen satnav with reverse camera, DVD player and USB/Bluetooth connectivity. You’ll also get the choice of speccing the car with a 10.2 inch roof-mounted LCD monitor. The multi-purpose vehicle comes with a new bronze gold colour and V-Kool Solargard Armorcoat window tinting. No other changes made to the engine or suspension. 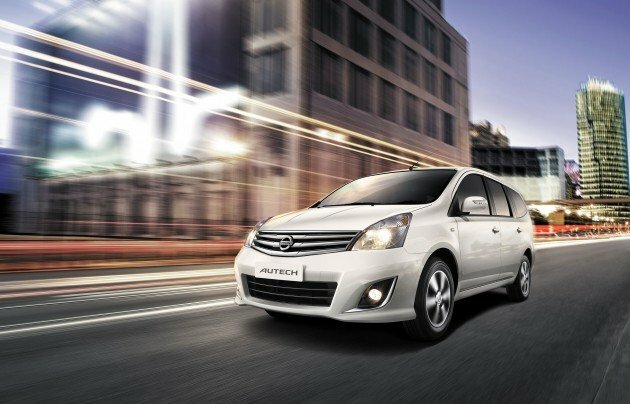 The on-the-road price of the Nissan Grand Livina AUTECH starts from RM105,800 and you can see it in all ETCM showrooms or in One Utama from July 11 – 15, 2012. I’m sorry but 105K for this… really not the the MPV I hope to. Prefer this over the Impul one. even the stock one too. Quite nice IMHO. But price, umm…. What is this? the 1.8L Auto? Or does it “start from” a 1.6 base with 105K being the starting price? pricelist shown 1.8L only for Autech spec. the priced increased to 7k for the bumper design, rims only and lcd screen only? WTF!! what is this thing?? like that also dare to show people, ugly mpv ever, even freed also look nicer than it. please copy Toyota mpv, and u can sell it well forever. Please install ESP in top of the range GL. Ayoo…so lambat masuk bolehland..this is actually the indonesian version.already outdated in indonesia and now coming into bolehland. Is ETCM trying to clear stock or what? Keep coming up with the different cosmetic variants??? Lame! Please put stability control (VDA) in your car. Seems that SAFETY isn’t your priority. Shame on you, Nissan. Extrimist. There is no shame on Nissan because there are also no stability control on the top-of-the line 2.5 Camry at RM180K. Only Honda treats us better with stability control on their City now. Well, lets check which car (WITH stability control) does Honda, Toyota and Nissan offer to Malaysian. Lets say for the price below RM170k. Malaysia need to spend RM173k for Nissan’s stability control (VDA)-Teana. That’s the Nissan’s love towards Malaysian. Owh…really touching. Manufacturers in Malaysia seem are becoming more and more expert in recycling old car liow by slapping on some loose bodyparts…..
hm… boring look and drive. this is not livina AUTECH..this is livina AUTA! Its obvious that ETCM reads this website, proven from the Ad of the new model to be launched from this website. So Dr Ang, if you are reading this, please stop insulting the intelligence of your buyers. Stop all these nonsense tuning that just involves bumpers, wheels, suspension or even exhaust pipes. Give your buyers better deals in the form of rear disc brakes, 5 or 6 speed auto, multi-link suspension, etc. Your loyal buyers are getting older and older. If you want to attract new followers, the Sentra, Latio, and the what not Impulsive Tuning etc is not the way to go. Your new Almera / Sunny is a good start, depending on the package offered. whats up with the 1990’s design aircon knob and slider!? RM102k for this garbage!? thanks, but no thanks! Just went to see the car, skirts needed. I think NGL 1.8 AUTECH is too expensive. Besides tuning by AUTECH, it should atleast has some features like the new Latio facelift – digital aircond, keyless, xenon headlamp and auto headlight on. Saya pemilik livina sejak 2008. Sangat tidak berpuashati dengan aircond yang tidak sampai ke tempat duduk belakang. Anak2 selalu komplen aircond tak sampai dan panas sampai boleh buka baju terutama bila cuaca panas…terpaksa buka blower ke paras maksima..bising pulak..Satu lagi tempat duduk belakang dah ketinggalan zaman. Anak 4..barang2 banyak bila nak balik kg.. timbul masalah sebab terpaksa susun barang sebelah anak kerana kerusi belakang tak boleh lipat sebelah..lagi satu anak saya yang kecik tak kuat nak tarik tali tempat duduk untuk dilipat…keluar modelbaru facelift pun tak selesai masalah…nampak gaya nak kena tukar si livina sebab masalah2 di atas. Pakar-pakar di nissan kena lihat contoh mpv lain..jangan bangga dgn livina yang tak mesra pengguna. Exzora bold pun lebih mesra pengguna..tahniah proton. then go buy EXORA la..choice is yours! Hello say say this livina really no good and out date.i have owe 1.8 falift 2011.price Rm:97,300.00 but nothing in board.we just want to some idea only.like valcano say proton MPV more better.do u has nissan livina? I’m 100% support u.because I also have one 1.8 model.same problem with u.radio tak boleh main mp3,music quality poor,tempat nak letar barang sempit.other issue is no second value just one year car drop 20K. Tan, then why do you bought this from the first place ? bought it blindly !! smack !! Still no 50/50 split 3rd row seat! I agreed with says says, the choice is always yours! If you think that you could not accept it then don’t buy. Nobody force you. It’s a matter of choice la..sebelum nak beli kereta boleh compare dulu yg mana ikut keperluan kita baru beli..like me i just bought GL 1.8 Impul version, berbaloi2 wa cakap lu..puas hati..aku jiwa muda & anak sorang so mmg mau cari mpv yg sporty n compact..yg penting bila drive GL ni rasa mcm drive sedan xmcm mpv lgsg. aiyoyo, grand livina outdate, shame on you. RM 100k mpv. pls, stop all the facelift model. bring in something new….don’t you know Exora Bold outclass you already…new kia rondo is coming to boleh land next year….heheh patiently wait for the kia rondo !! Autech would look nice with aerokit..very sporty indeed. Poor Customer Services at ETCM. Order placed for G.L.Autech since 10 Dec 2012. Till today , nearly 3 months, still cannot promise of any date of delivery. Once called, keep pushing to their production side at KL. Initially, cheated me of delivering by Chinese New Year. Then, keep silence unless I called up. PLEASE THINK TWICE BEFORE YOU ORDER WITH ETCM, NISSAN. TCM , Please consider for your Nissan Lavina costumers at least provide with USB and MP3 support for the pries of the car . Now days its a necessary to have in all players . How come you dont see this importance and technology at this ends .